WE BUILD COMPLETE NEW SEATS. So, if you purchase a Borbro seat, YOU DO NOT HAVE TO RETURN YOUR ORIGINAL SEAT - unlike at most other aftermarket seat producers - because that's not what we work from! 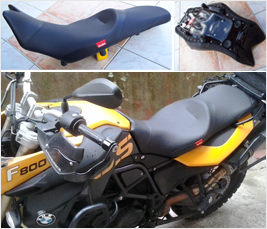 If you feel any problem with the sitting comfort of a seat, then it probably begins at the level of its base pan. 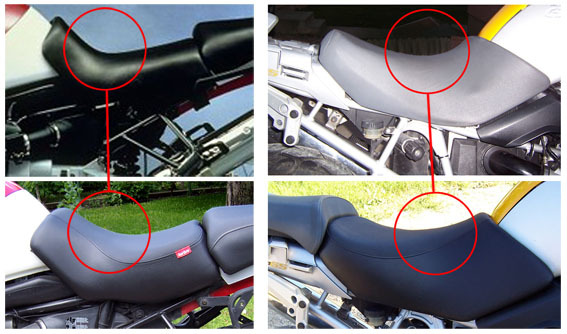 This way you can use your bike continuously, and later - if you want - you can sell your factory seat, that can recover the bigger part of your new seat's price. In our mind the motorcycle seat is the part that connects the MAN and the MACHINE. With the continuous developing of our seats and their production we are on to make this relation better and better and to make the joy of motorcycling as comfortable as we can. We've created our base pans to give a stabile and sturdy support for the cushion with a flat surface and without any salient element (nuts and bolts, stiffening ribs, sharp corners, etc.) that could cause unwanted pressure points under the drivers' bottom. The rigidity of the laminated fiber glass base pans allows us to have a plain surface below the foam without any stiffening rib, which also gives additional place for foam thickness. The seat holder fixing nuts are also implemented under the surface to avoid the appearance of any pressure point that could cause numbness in the legs. 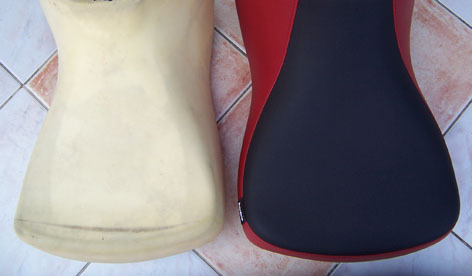 The shape of the Borbro cushions significantly differs from the original factory foams. We do not think it a good compromise to make seats with steep surface (and a too deep front part), that can not keep the driver in his/her right position during the rides (especially at breakings) just to have more potential buyers (- also with smaller heights). That's why our seats feature a higher front part, that holds the driver well in his ideal position, and enables him to sit with a straight (vertical) spine - without slipping on the tank continuously and to be forced to travel on his balls. 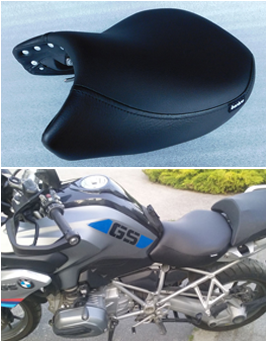 Borbro seats also ensure the painless biking with our unique Ergonomic Comfort Groove created to easen the tail bone (- Oxys Coccyx) during the long rides with taking away the weight from its end. Those who had already problems around this part of their body will really appreciate this smart solution.. In plus our seats give wider support for the driver's bottom with their increased cushion width at the rear (sitting) part of the seat. We prepare the Borbro seat covers with clean seamlines, where the Form Follows Function design serves decently the priority of comfort without trying to seem more flashy than it should be. 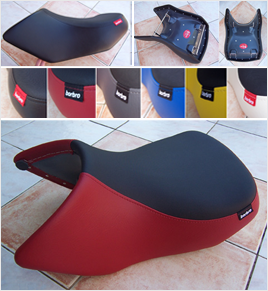 But at the same time we are on to fulfill your colour combination imaginations with our good quality automotive and marine vinyl materials (with plain and anti-slip surface) to make your new seat as much harmonizing with your bike as we can. 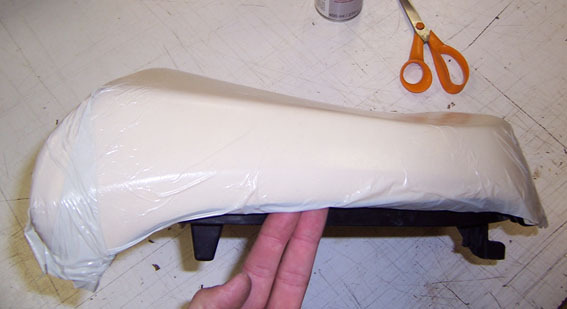 For waterproofing (on new seats or recovered pillion seats) we recently use a thin foil below the cover to separate the foam from wet. It's a much more simple way than the other, industrial solutions for keeping the cushion dry, but according to our experiences, one of the most effective ones.